Thanks to smartphones and tablets, technology is changing when it comes to all sports. Today we’re talking about a sport that is one of the easiest to apply technology to, which is golf. I used to think that having a device such as my SkyCaddie GPS to tell me the yardage from where I was standing to the pin was about as good as it got. I would stand on the course, whip out the GPS, and check the yardage. I would then adjust my club to what the book said would make it to the green based upon the yardage then promptly hit it into the lake. That SkyCaddie cost me a few hundred dollars and now I felt really stupid losing yet another golf ball into the darn lake. Not the fault of the GPS as it was actually a pretty cool and very accurate device. It gave me the distance to the pin. My problem is I can’t hit it straight. So I sold my SkyCaddie a few days later knowing that I was so bad that a SkyCaddie couldn’t really make a difference. I could just as effectively hit that ball into the water without a golf GPS. I even had a mount for my golf GPS. I threw that into the deal for the guy that purchased my SkyCaddie. Hopefully he has gotten many years of happy use out of his GPS and mount combination. So now we have applications on smartphones. I think the top advantage of these apps is that a lot of them are free or less than $15. I still the ball into the lake but I don’t feel as stupid using that free application on my phone versus the $200 golf GPS. So what we are seeing is a major shift from the physical GPS to apps on phones and tablets. Your phone or tablet is a computer with a high definition display. Applications are no longer isolated to telling you the distance to the green. They now tell you everything from the rules of the game to setting up a tee time to, naturally, high definition GPS renderings of your favorite golf course. 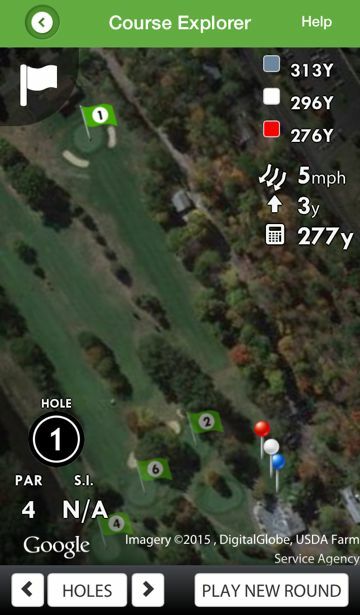 SwingxSwing is a free GPS application that renders detailed maps of the course you are on. It uses Google Maps satellite views, tells you the distance to the pin, keeps score and tracks your rounds. A lot of the functionality requires registration but most of it is free to use. It has most of the golf courses in my area here in Northern New Jersey so it’s likely to have one near wherever you are too. The photo that is alongside this article is from the SwingxSwing application. It’s the first hole of one of the neighborhood courses. Golflogix was one of the prominent players in the handheld golf GPS market. They realized the technology move away from the handheld arena to the smartphone early and have come out with an excellent GPS application. The basics of a golf GPS are free with this application. They have detailed renderings of each hole versus the Google Map view used by SwingxSwing. A $19.99 upgrade fee is worth it for frequent golfers as it provides discounts to places like GolfSmith and a $20 tee time discount using GolfNow (see below). This is a feature rich application worth exploring. The download and basic functionality is free. GolfNow is a very useful golf application that isn’t a GPS. This application will allow you to check out the neighborhood tee time availability, the cost of the round and will allow you to book your round. Tee times along with the applicable fee are shown for that time. The app even tells you if the cart is included or additional. This application is also free. Ever get called on rule interpretation by a very serious golfer? The Rules of Golf is written by the United States Golf Association (USGA). A handy search function will bring up the rules of the game given your particular situation. For example, a search on my favorite topic “water” brings up a dozen or so rules including the always applicable topic of Dropping and Re-dropping. Finally, if you are as poor of a golfer as I, why not relax with a game of Tiger Woods Golf or my new favorite, Mini Golf Stars. Neither game involves losing a golf ball and you will have a chance for par after practicing a few days. It’s a great game to play on a long flight or simply when the weather isn’t accommodating a round of golf. You may not believe it, but we have written a lot of mounting articles on the subject of golf. If you want to use a smartphone on the golf course, take a read of our article on using an iPhone or iPad on the golf course. If you are in love with your handheld golf GPS and want to read about some mounts, we have an article on that topic. We even have specific articles on mounting the Izzo Swami 4000 GPS.